After I received my coat of arms, I thought about creating a heraldic badge. In feudal times, a badge was a symbol worn to show allegiance to a particular individual or family. Hence, a nobleman's retainers, dependents, followers, and vassals would wear his badge. I didn't (and still don't) have retainers or vassals, but I wanted a badge nonetheless. Many heraldists have badges and nobody to wear them. I designed my own badge by combining two symbols. First is the Chinese coin from my coat of arms. 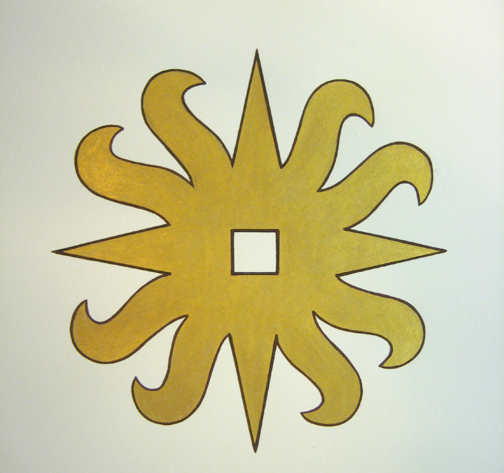 I added twelve sunrays, four straight and eight wavy, to it so it would also look like a sun in splendour, a European heraldic device. The result is also reminiscent of another Chinese symbol, the twelve-ray sun that is the national emblem of the Republic of China, which appears on its flag (often but incorrectly called the Taiwan flag). At the same time that I petitioned the Canadian Heraldic Authority (CHA) for a badge, I also applied to register it at the South African Bureau of Heraldry. I sent my application to South Africa in December 1990, the Bureau of Heraldry registered the badge on October 4, 1991, and I received the certificate on January 15, 1992, just 13 months after I applied for registration. 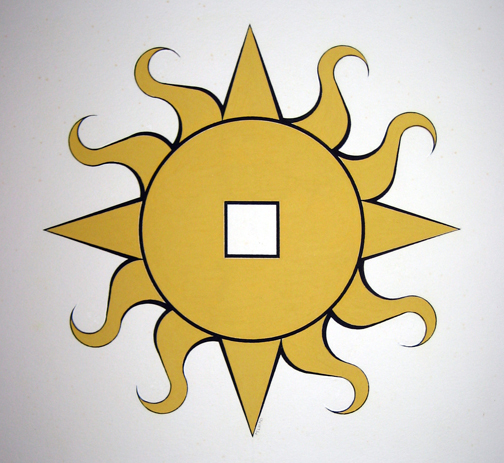 A sun in splendour of twelve rays, pierced square, Or. The South African Bureau of Heraldry took just over a year to register my badge and send me the certificate. In contrast, the Canadian Heraldic Authority took 7 years even though it accepted my design and didn't make any changes to it. The CHA received my petition for a grant of a badge in August 1990, approved the grant on March 4, 1996, and sent the Letters Patent to me in September 1997. The CHA worked slowly in the 1990's, possibly due to demand for its services after its creation. The CHA now says on its website that the process usually takes 12 to 14 months. The CHA adds so much beauty and splendour to Canadian culture, heritage, and multiculturalism that I hope that potential armigers will receive and display their new coats of arms and badges shortly after they have petitioned for them. 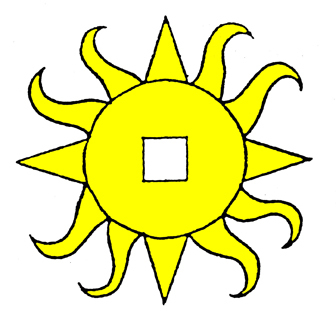 A sun of twelve rays, four straight and eight wavy set alternately Or quarterly pierced at the centre. Heraldic artist Joan Ouellette painted my badge for the Letters Patent. In a rare departure from heraldic tradition, the painting on the Letters Patent does not outline the badge's features in black. I had a Chinese seal engraved showing my badge. 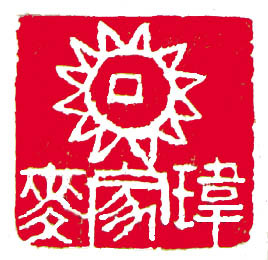 The seal engraver gave the sun twelve short rays like the sun in the national emblem and flag of the Republic of China. Canadian Heraldic Authority, grant, The Public Register of Arms, Flags and Badges of Canada, Volume III, page 122, March 4, 1996. Bureau of Heraldry (South Africa), registration certificate 2363, October 4, 1991.